1) All monks, include those who tonsured in the east and west, and the traveling monks, may join this program. Application deadline: August 16, 2017. Only those who are approved by the head office will be permitted to attend the program. 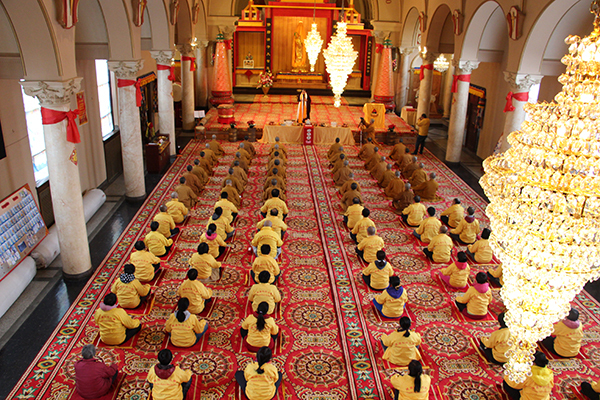 2) The Precept Platforms Dharma Conference is specifically for monks of GHMZ only. Monks from other denominations will not be permitted to enroll. 3) Holy Maintain Buddha Land is sacred land. Please check-in 3 days prior to the start date of the program. Latecomers will not be allowed to enter the premises. 4) Those who have earned the Certificate of Ordination from other countries, such as Mainland China or other regions, must submit their Certificates during the registration. Those who did not bring their Certificate of Ordination will not be permitted to register. 5) Monks must bring with them, their own GHMZ Scriptures to the conference. – The teaching of “Triple-Heart Health Dharma”, and more. 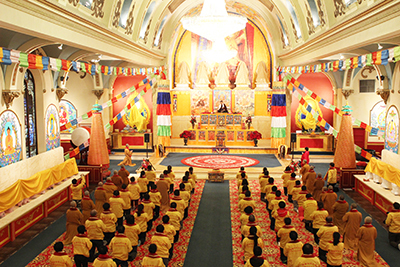 – Convey the “GHMZ Great Perfection Dharma”. – Practitioners will be relieved from common symptoms of middle-aged health, have the quality of genes enhanced, be able to bring benefits to their descendants and the community, and will be able to help prosper their nation. – Qualified students will confer with Instructor Certificates after going through a systematic training program and examination. Those with excellent scores will be recommended to teach in different countries, or remain at GHMZ headquarters. 1) Applicants between the ages of 23 to 56, with good health conditions, a deep foundation of wisdom to cultivate themselves and attain enlightenment, and a dedicated heart, will be accepted with priority after examination. 2) Those who have attended the instructor training classes and instructors with certificates, or those who have attended the Achievement Dharma Convention for the Young and Middle-Aged, may enroll directly. They are entitled to 50% off of the course fee upon status review and approval by the administrative office. 3) Those who have learned the Advanced Level III Class can attend this training program free of charge. *Food and lodging is $40 per day for those who attend this class. 1) Applicants who intend to join the class must be free of commitments during the course, and have prior approval from his/her family. 2) Applicants shall provide a recent medical record within 6 months, academic diplomas or certificates, and 4 passport photos (2” x 2”). 3) The applicants must submit their applications 10 days before the class/program begins. Only those with official approval will be permitted in class. 5) We encourage all attendees to travel light, with a maximum 2 baggage. 6) Guang Huan Mi Zong Holy Mountain Buddha Land is a sacred land for the assembly of Arhats, Bodhisattvas. It is a Holy Place for meditation and pilgrims. Attendees must dress to be presentable at all times and obey all rules and regulations of the Temples. 7) Students are responsible for their own lodging, meals, and travel expenses.